Originally designed by John Browning in 1905 for use with his prototype Colt semi-automatic handgun, the .45 AUTO was one of the most effective pistol cartridges of its time. The .45 AUTO combines precision with power, making it highly efficient against large game and human targets. 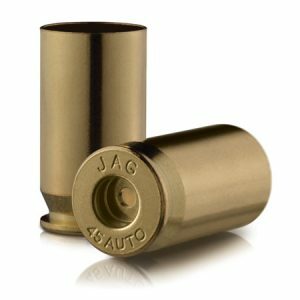 The .45 AUTO features a straight, rimless design, a low muzzle blast and moderate recoil. The relatively low maximum chamber pressure is often cited as a factor in prolonging the life of the weapon. Today, the .45 remains popular amongst tactical law enforcement units in the United States as well as with police and military forces around the globe. Drawn from American-made premium brass cups, each casing undergoes rigorous in-line and post-production quality assurance testing to ensure a flawless casing of unparalleled durability and dependability. Standard casing dimensions and tolerances have been modified to achieve maximum performance. Jagemann™ Technologies’ in-house tooling and engineering capabilities provide the ability to customize casing dimensions for use with specific projectiles. If you have a custom request, we will meet your needs.